Following the success of the 2014/15 Elvis at the O2 exhibition, which attracted a staggering 200,000 visitors, Graceland have decided to return to London’s O2 Arena with the Elvis on Tour The Exhibition. 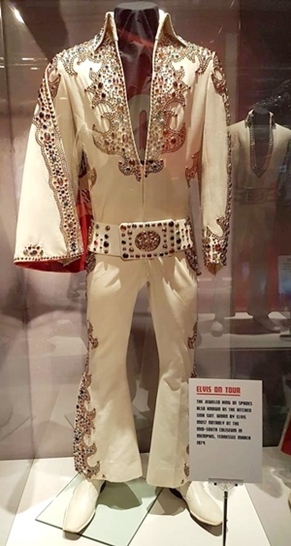 The focus this time has been narrowed down to the period from 1969 – 1977 and over 200 items are included from the Graceland archive, including over 35 outfits, costume sketches and guitars that Elvis used onstage. Zoey Goto, author of Elvis Style: From Zoot Suits to Jumpsuits visited the exhibition to meet with Graceland’s director of archives, Angie Marchese to discuss how the show was put together and Elvis’ unique style. ZG: What did you want to communicate with this exhibition? AngieMarchese: We really wanted to give the visitor the opportunity to get the feeling of what it was like to be on the road with Elvis. Not only what it was like to see a performance but also what was happening behind the scenes. We wanted to show just how much he worked – starting in Vegas in ’69, performing 29 shows in 10 days. The next engagement was 57 shows in 28 days. 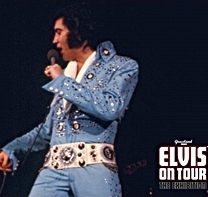 Between ’69 and ’77, Elvis performed over 1100 sold out concerts. We wanted to show just how much he gave of himself to his art. Of course we also wanted to show the fashion statements, from the two-piece tunic outfit from ’69, right through to the jumpsuits of the ‘70s. Elvis was always ahead of the trend and comfortable with his own sense of style. ZG: You mentioned that you wanted to show what has happening behind the scenes while Elvis was touring. How were you able to do this? AM: We wanted to display not only the stage-wear but also some of the backstage and rehearsal outfits. We’ve included one of my favourite jackets, which is the rainbow fringe jacket by North Beach Leather. 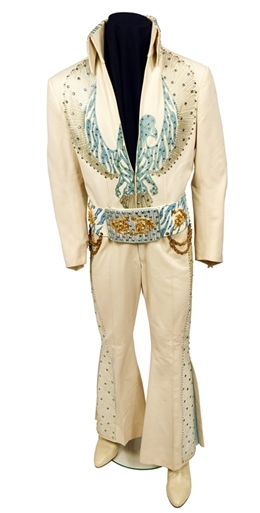 If you saw Elvis hanging around backstage, that’s the kind of outfit he’d wear. We also wanted to show that it wasn’t someone else who was telling Elvis to do what he did. He was in total control of the show creatively – from the musicians to the arrangements to the wardrobe. ZG: That’s a really interesting point. When I was researching my book I found that a lot people assume that there was a stylist behind the scenes telling Elvis what to wear, but actually he had so much creative control of his image. ZG: What is the must-see piece in this show? AM: The most poignant item is the trunk of scarves from his last tour. 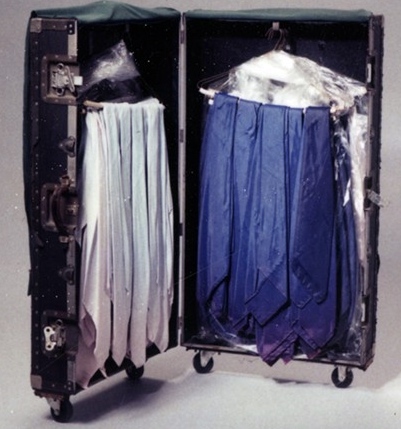 It was very memorable opening this trunk when we found it in storage at Graceland. Most of the trunks had been empty and we opened that one up and it was completely full of scarves. It was ready to go on tour when he passed away. It’s never been displayed outside of Graceland. ZG: In terms of fashion, I think the era you’ve chosen (‘69-‘77) is the most interesting period as this was when Elvis was really pushing the boundaries of style to their extreme. AM: He really did, and he was of course the first artist to wear a jumpsuit. The jumpsuits became blank canvases for him and the designers to go crazy with ideas and themes. 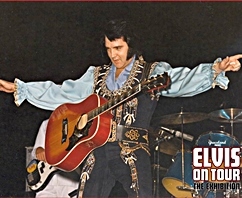 After Elvis started wearing jumpsuits it influenced artists like David Bowie and The Osmonds. Elvis is one of the first artists where the concert wasn’t just about the music. It was also about what he was wearing. Whenever you read reviews of the show they are very descriptive about what Elvis wore. It’s much more common now for people to care about what an artist wears. For example, my daughter will always notice what Harry Styles is wearing. 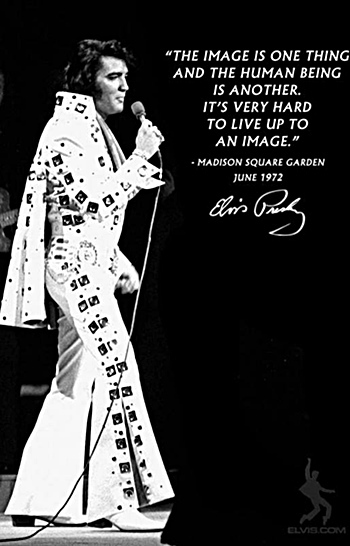 ZG: And Harry Styles has of course been very influenced by Elvis. AM: Very influenced. My daughter makes that connection herself all the time. She was actually at his show the other night and was like “Harry wore gold lame like Elvis!” Miley Cyrus with her jumpsuits is another artist influenced by Elvis. ZG: I talk about this influence that Elvis has had in my book – from British musicians like David Bowie to contemporary stars such as Justin Bieber. I think it’s interesting to also turn that question on its head and think about who was influencing Elvis and where he got the ideas for these fantastic outfits that we can see here today. AM: Believe it or not, the idea for the capes came from Elvis’ love of comic books and super heroes as a kid. Then the design side was very much collaborative between Elvis, Bill Belew and Gene Doucette. 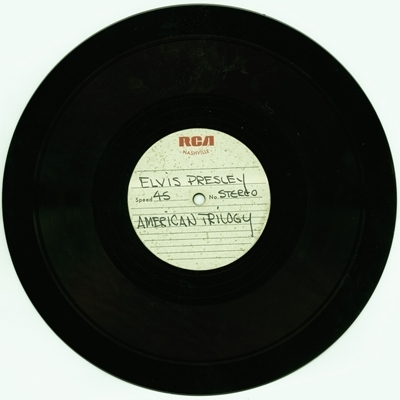 For example, for the Aloha show Elvis started with the idea that he wanted something that reminds you of America. So the designer Bill Belew came up with the red, white and blue eagle. There’s also a nice story about the Phoenix suits, that originally Bill sketched a zebra, but Elvis looked at it upside down and said “Man, that looks like a weird bird!” so Bill had to then create what Elvis envisioned, which was a bird versus a zebra. Elvis was very open to ideas and it was very organic. There are also elements in his later stage-wear that date back to the 50s – the high collars and the pointed cuffs. 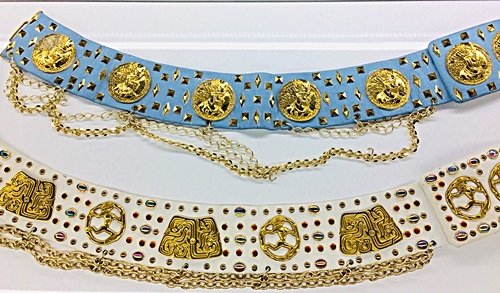 Bill Belew carried these along with him from Elvis’ personal sense of style. ZG: I understand that you’ve also curated the Prince exhibition that has just opened next door at the O2 centre. Could you tell us a little about that? 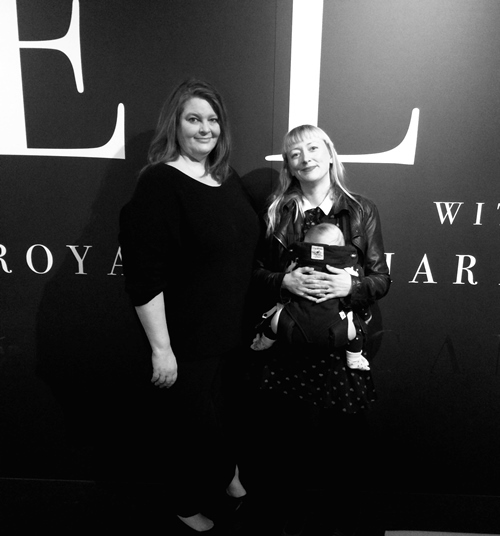 AM: The Elvis and Prince exhibitions were very different to curate. Prince was also a style icon but he was changing his entire appearance between each album. Prince was very comfortable in what he was wearing – even if it was just a g-string and a jacket for the Dirty Mind album. This is the first exhibit ever done about Prince and it all comes directly from the Paisley Park archives. I wanted this exhibit to represent everything that Prince was musically. The die-hard fans will hopefully remember why they fell in love with Prince as an artist, while the casual fan will walk away with a new appreciation for Prince as a musician. When Prince passed, the fence outside Paisley Park became a space where the fans could come to say thank you and goodbye. The best part of the exhibit for me is the fence that we’ve put up where people can leave memorials that then become part of the exhibit and part of the archives. 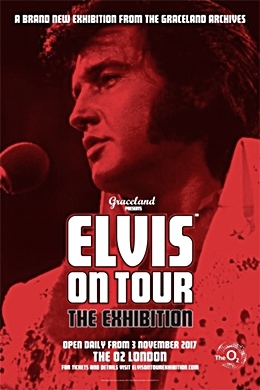 Elvis On Tour The Exhibition is at London’s O2 Arena until the 4th February 2018. Tickets costs: Adult £25 / Child £ 12 / Concessions £18. Exclusive EIN Report: A Night in the Presley Family Apartment: Author Zoey Goto recently visited Memphis where she stayed overnight in the Presley family apartment at Lauderdale Courts. In a great narrative-visual account (exclusively for EIN readers), Zoey provides an in-depth report of one of the lesser known places for Elvis fans to stay when visiting Memphis. Zoey's article is accompanied by stunning and exclusive color photos. Who wouldn't want to sleep in the bedroom occupied by the teenage Elvis? Go here to check out a treat that no Elvis fan should miss out on..
New London Exhibition, 'Elvis on Tour': Elvis Presley returns to The O2 in London with a new exhibition, Elvis on Tour, opening tomorrow November 3, 2017. Following the mammoth success of 'Elvis at The O2 exhibition' which was visited by over 200,000 people, Elvis on Tour The Exhibition will showcase more than 200 artifacts from the Graceland archives many of which will be in the UK for the very first time. 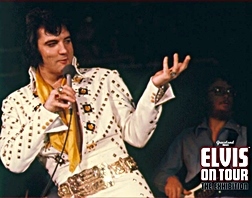 This new exhibition covering the years 1969 – 1977 will provide an in-depth look at the world that was Elvis on Tour, offering a unique insight into exactly what drove the audiences wild in the ’70’s – the chance to see the King in concert as he toured America. 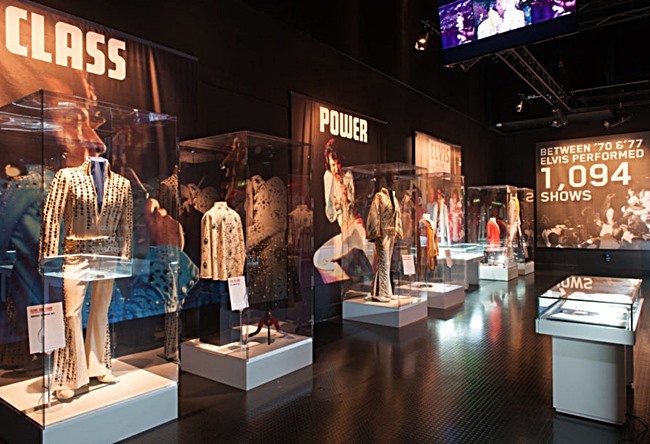 Bringing together dozens of examples of Elvis’ costumes and stage wear along with the guitars, jewellery, posters and - for the first time - unique interviews with Elvis’ touring band. Opens November 3, 2017 Tickets: Adult £25 / Child £12 / Concessions £18. Elvis London O2 Exhibition EIN Review: Having visited Graceland several times the lure of being able to see more than 300 of Elvis’ personal belongings in a less tour-group-timed environment was an opportunity not to be missed. 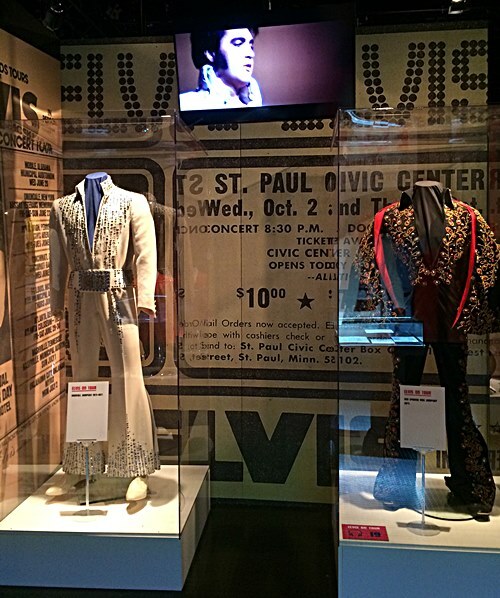 The display is sorted into 10 different rooms focusing on Elvis’ fabulous career from his very early beginnings in Tupelo, to the start of Elvis Mania, his Army Years, Hollywood, the 68 Special, his later concert years and the lovely section dedicated purely to Graceland. In each room relevant Elvis music helps create the right atmosphere along with various interviews, recording sessions and suchlike. To be honest I was expecting something a little more tacky but, surprisingly, a lot of thought and attention has been put in to the display and what has been chosen to be exhibited. Some of the items on display were a delight to linger over. 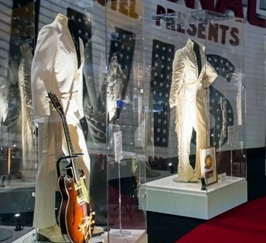 Go here for EIN's Piers Beagley's look at the London ELVIS O2 exhibition - now open until January 2016!